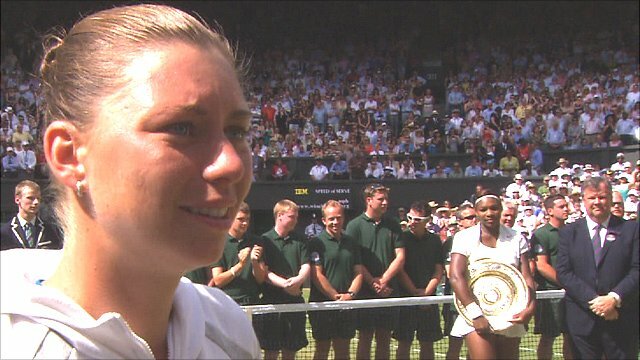 World number one Serena Williams powered past Russian 21st seed Vera Zvonareva in 66 minutes to win a fourth Wimbledon and 13th Grand Slam title. The American came into the final having not dropped a set and with 80 aces, and she stormed to a 6-3 6-2 victory. Zvonareva, playing in her first Grand Slam final, was outplayed and could not force a single break point. The victory takes Williams past Billie Jean King to sixth in the all-time list of female Grand Slam singles champions. Looking towards her illustrious compatriot in the royal box afterwards, Williams said: "Hey Billie, I got you, it's number 13 for me." And she added: "It's amazing to be among such great people. Vera has been through so much and everyone should give her a big cheer - she really defines what a champion and never giving up means." 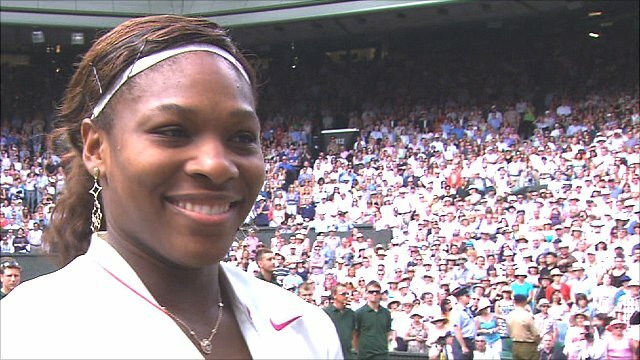 Williams, 28, retains the crown she won in 2002, 2003 and 2009, and ensures that between her and sister Venus, the title has stayed within the family for nine of the last 11 years. With just one win in six matches against the world number one, and that victory four years ago, it was imperative that Zvonareva stayed in touch in the early stages. An ace and a backhand winner down the line in the opening game served notice that Williams was not suffering any pressure as the overwhelming favourite, but Zvonareva did well to see off the first break point of the match on her way to levelling at 3-3. Williams was furious with herself for missing a second break point in game eight when she hammered a backhand return into the net off a Zvonareva second serve, but a brilliant lob and a running forehand pass ensured the chance was not wasted. Fifteen winners could not mask the fact that it was not yet vintage Williams but she was serving well enough to stay ahead and wrap up the first set in 36 minutes. 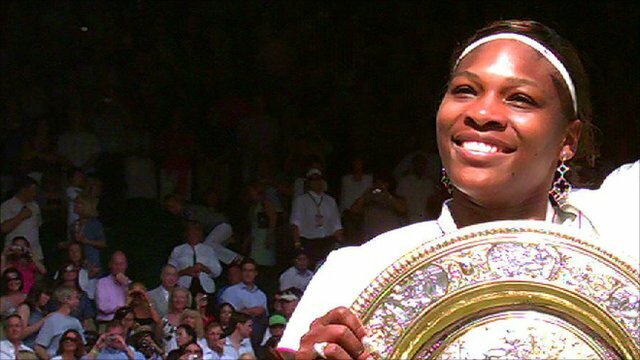 How many Grand Slam singles titles will Serena Williams win? Zvonareva, the second-lowest ranked woman to play in a Wimbledon final, had performed well enough without threatening to break the American's serve for only the fourth time in the tournament. And when the 25-year-old from Moscow dumped a mid-court forehand into the net to drop serve at the start of the second set, Williams was already within sight of victory. Zvonareva had remained impressively calm and focused on her way through the draw, but the emotional side of her character threatened to take hold when she double-faulted to fall two breaks down at 4-1. It was brilliant, brutal stuff now from Williams as she totally dominated on serve, moving forward at every opportunity, and although Zvonareva managed to stem the tide briefly with a final service hold, there was no doubting the outcome. Serving for the championship, Williams opened the game with a huge 122mph ace - her 89th of the tournament - and moments later thumped away a smash on match point before throwing her racquet into the air in celebration. Zvonareva, who slipped out of the world's top 10 last year after she underwent ankle surgery, said: "I'm a little bit disappointed at the moment, I was not able to show my best today. Serena just didn't allow me to. She was playing really well." The Russian added: "It means a lot - those people in my box were here for me today, also the surgeon who did my surgery last year, because of him I was able to be here today. I was doubting I would be able to play tennis again."